The Bulldog Cafe Amsterdam, properly called the "Bulldog Palace", is one of Amsterdam's most famous venues for going out. It's part of the Bulldog Amsterdam chain which runs coffee shops (where you can legally buy marihuana and hash), cafes, a hotel and even a bike rental company. The Bulldog Cafe Amsterdam, located at the Leidseplein, is probably the best known of all the Bulldog outfits. It opened doors in 1985 in a unique location: a former Amsterdam police station on one of Amsterdam's most popular squares. A regular of Amsterdam's police stations (where he would end up after being arrested together with his clients back in the 1970s and early 80s), owner Henk de Vries bought the building of the Amsterdam police headquarters at the Leidseplein and inaugurated it on April Fools' Day 1985 - something that was to be considered a bold statement. Actually, because Dutch laws don't allow coffee shops to serve alcohol, the Bulldog Cafe Amsterdam and its attached coffeeshop are in separate buildings with their own main entrance. The coffee shop is downstairs. The attached souvenir shop sells custom-made merchandise, all carrying the Bulldog chain logo. 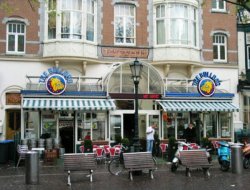 The Bulldog coffee shop at Leidseplein made headlines in November 2008 after being nominated as one of the 43 coffee shops threatened to be closed down as part of Dutch authorities' new national regulations regarding soft drugs. The new rules say that coffee shops cannot exist within 250 meters of schools - and the Bulldog coffee shop is too close to the Barlaeus Gymnasium, a well-known Amsterdam high school. A storm of protest emerged and the Bulldog management made clear they wouldn't give up so easily. The future of the coffee shop is still unclear, but in any case it won't have any consequences for the Bulldog Cafe Amsterdam since, as we said, it's formally separated from the coffee shop even when they're right next to each other. One thing the owner of the Bulldog Amsterdam is proud of, are the numerous celebrities that have been visiting the place throughout the years. There's photographic evidence of the attendance of at least David Bowie, Mariah Carey, Snoop Doggy Dog, Gloria Estefan, actor and former Madonna husband Sean Penn, and Mötley Crüe's Tommy Lee. 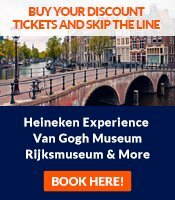 Are the Amsterdam cannabis cafes being closed?